Record a series of messages to this dedicated speech generating device and then play back each message using one of three modes - Randomization, Random Elimination, or Choice Making. Includes 4-minutes of record time, 2.5-in/6.4-cm switch top. 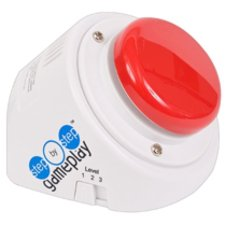 Incorporating the Step-by-Step GamePlay into game-based instructional lessons enable students to learn basic skills such as eye-hand coordination, and more complex skills such as problem-solving. Learning through the use of games is highly motivating and encourages collaboration, which offers another way for students to interact and communicate with each other. Along with fostering language and social skills, strategic thinking is developed as students are challenged, motivated, and engaged. Level 1: Randomization - Randomizes your message selections. Level 2: Random Elimination - Randomizes the selections and once a selection is played, it is eliminated. Level 3: Choice - Allows a user to skip through a series of messages to get to the desired message by activating the surface multiple times in a row. In just a few minutes, AbleNet makes any game an accessible game.